It’s Donna here and the challenge for this month is all about Stencils. You can link your project here. Please be sure that your project contains at least ONE main HERO ART Product as the focal element! Here is my card, I am using the new Hero Arts Peacock Feather stencil, the Hero Arts Color Layering Peacock stamp set and the Hero Arts Color Layering Peacock Frame Cuts. Closer look at the peacock and my background. 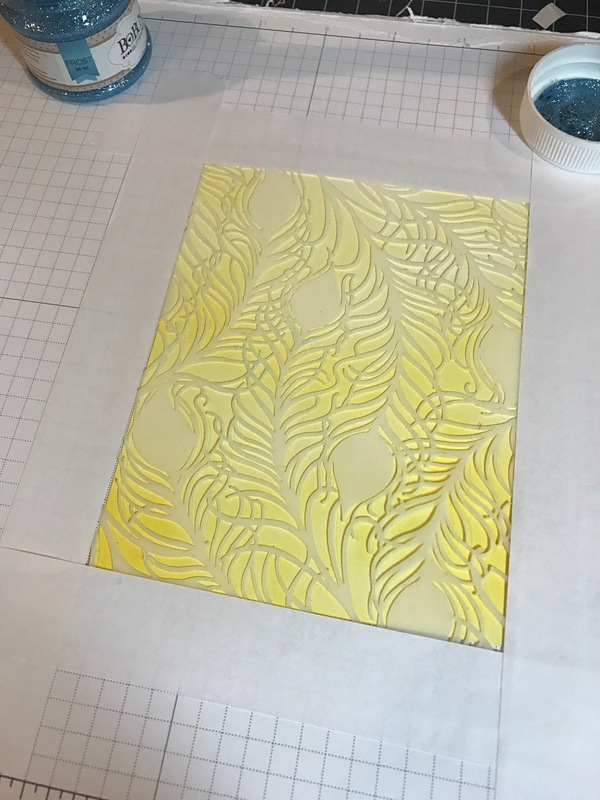 I first used the Hero Arts Butter Bar and inked the layer, then I laid my stencil on the inked layer and taped the edges down so the stencil would not move. I then spread the Bo Bunny Frost Glitter paste down with my tool. I set this aside to dry. I then took the layering peacock framed cut and die cut it out. 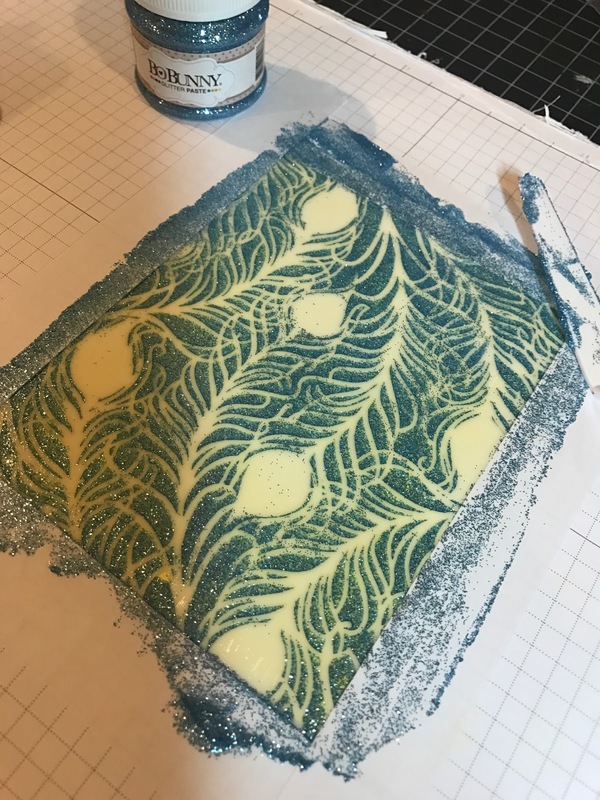 I then used the Peacock Layering stamp with the Hero Arts Navy, Hero Arts Deep Ocean and Hero Arts Butter Bar inks to layer the peacock. 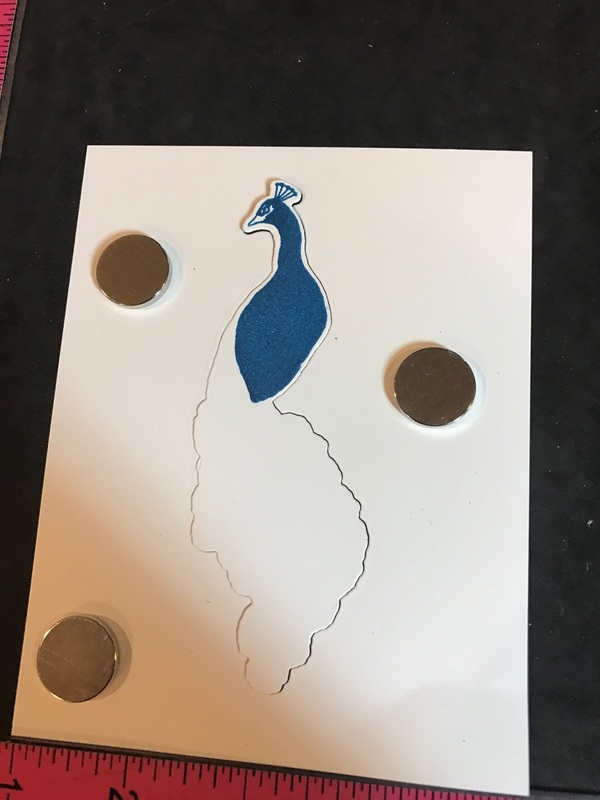 I didn’t have all the recommended colors for the Peacock, but I think it came out pretty nice with the colors I used. I finished my card off by adding some Yellow Stickles to the Peacocks tail and added some Hero Arts Ombre Blue sequins. SECOND CHANCE TO WIN: During the month of March, we’re giving you a second way to win a $25 Gift Certificate to the a2z Store! Just comment on any blog posts in March. Categories: Challenges, color layering, Handmade Cards, Hero Arts, Stencil | Tags: Hero Arts Color Layering Peacock Frame Cuts, Hero Arts Color Layering Peacock stamp set, Hero Arts Ombre Blue sequins, Hero Arts Peacock Feather stencil | Permalink. A beauty of a card. The colors you used are striking. Love the yellow stickles you used on the tail. Awesome background for that pretty peacock! Love all the sparkle! Beautiful background with peacock feathers! Love this peacock. I love love, love the background! WOW! That is STUNNING card with the stencil and color layering peacock. Such a fantastic background, perfect with that pretty peacock!! Wow, this is so bold and eye-catching!!! Fabulous! LOVING the peacock. What pretty colors you chose. They are the true colors.